There were seven of us, including my sister, her husband, and his two sisters, who flew to Las Vegas, rented a white Ford van, and toured the northeastern part of Arizona. The land is arid, free of greenery, and filled with hills, mesas, buttes, cliffs, and canyons. 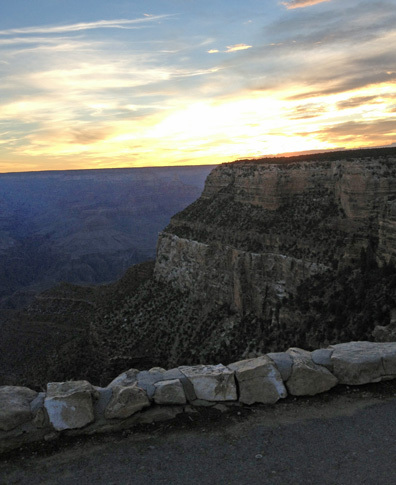 We visited the Grand Canyon and spent the night at the El Tovar Hotel where presidents have stayed. I got up at five one morning, sat on a big rock on the trail at the rim of the Grand Canyon—a geological spectacle one mile deep—and watched the sun rise and throw light against the cliff walls. Reds. Oranges. Sculpted rock. Majestic. East of the canyon we went on a smooth water raft trip from the Glen Canyon Dam up the Colorado River and also took a slot canyon off-road Hummer tour, where we viewed the red rock canyons and landforms created by years of wind, rain, flooding, and fluvial abrasion. We went to the Navajo reservation and saw dinosaur tracks, bones, and eggs. Then we traveled on to Hopi land—Third Mesa, Second Mesa, and First Mesa—and saw the oldest continuously inhabited town in the United States. At White Bear Hopi Art gallery I bought a Kachina doll made by one of the local artists. We went to the Painted Desert, a meteor crater site, and the Petrified Forest, and we drove on the old Route 66 and stopped at Juan Delgadillo’s Snow Cap Drive-In where the daughter made jokes like the father used to. To end the trip we made our way down to Sedona for a couple of days of touring and shopping. I fell in love with Arizona. 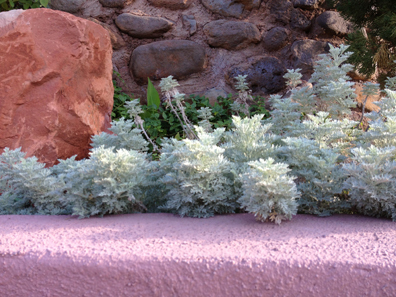 I wanted to bring home the sage green succulents and trailing plants and the pink-red rocks. I couldn’t absorb enough of the view of the landforms. Beautiful. Colorful. Carved rock. Majestic. Then a thought came to me. I was looking at the wonder of canyons and cliffs. I saw only beauty. But that beauty was carved over time out of harshness and upheaval. Violence within—earthquakes and volcanoes thrusting the rock upward. Fury without—a raging, flooding river cutting deep and wind blowing sand and rock, the friction cutting the earth. Battered. Washed over. Pounded upon. How much like life is that? Something good and strong and beautiful is created out of pain and tumult. I look around me at the wonder that is my yard. How can a flower be bigger than my hand? And so beautiful? I don’t understand how nature can create something that is beyond words. 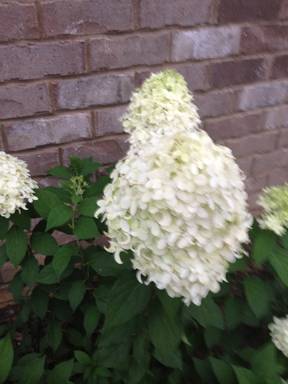 I wanted a popcorn bush or a white hydrangea like the ones at the entrance to my subdivision. But I ended up getting a limelight hydrangea. I could look at it all day. 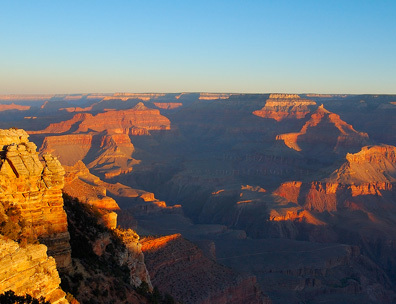 I think about going far off to wonders of the world — canyons, big rivers, and red rock mesas. And then I look at my hydrangea bush. And at night I look up through the big fifteen-foot high windows in my dining room and see an almost full moon shining down on me. And I think…I don’t need to go anywhere. I am content right here. There is beauty all around me. There is amazement all around me. Six in the morning July 4. I sit on my deck looking northeast at an ever-lightening blue sky fading to cream. If the sun is up, I can’t see it; it’s behind houses on the next street. 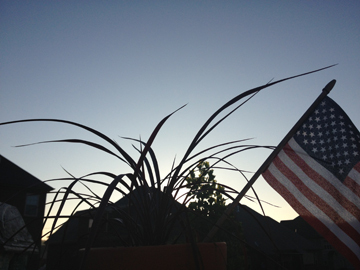 Against the sky is a little flag I’ve stuck in a flower pot waving in a cool July breeze. Behind the stars and stripes is a tulip poplar against the backdrop of a neighbor’s roof line. I hear the hum of traffic to the north—could it be from 840? The birds are starting to get excited about the sun coming up. I hear the “drink your tea” bird mixed in with choruses of the others. I’m wearing my Franklin Jazz Festival ’98 tee shirt. That was such a long time ago. It was the year Molly died, the year Chaeli was born. Charlie and I used to go every year to the jazz festival, and he always bought us tee shirts, and now, that’s what I sleep in. If he were here this July 4, we’d grill. Ribs, shrimp, steak. But he’s not, and I won’t. I think back to my old neighborhood. Every July 4 there was a patriotic kids’ parade down the main parkway. Children would decorate their bikes or trikes in red, white, and blue, and there was a prize for the best. My new neighborhood doesn’t do anything. The sun starts to throw its light against the tops of trees behind the eastern arc of Aenon Circle. The sky grows brighter above the steep pitch of a neighbor’s roof. It’s really cool for July. My tee shirt is holding the cold breeze against the skin of my back, and I can feel the chill on my arms. 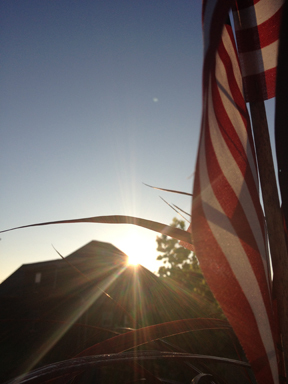 I look at the flag of my country in the pot—dawn’s early light, and it’s still there, waving o’er the land of the free. I think about my country. I worry about it. It seems we just can’t get things together. We have a violent past, a dark history. The natives who were living on this land when we arrived? We killed them, we ran them west—my own ancestor John Mahaffey was a savage Scots-Irish Indian fighter on the frontier of Pennsylvania and Ohio. He was also a revolutionary soldier. 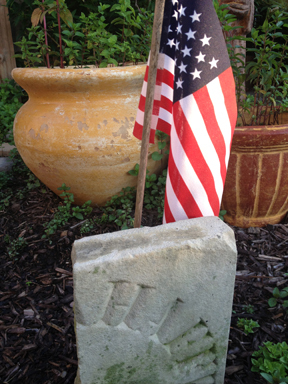 I have part of his original tombstone in my back yard. I’m proud of my fourth great grandfather who made this a country . . . even though it became a country by killing and taking. Family land that I now own in Mississippi has seventy-five Choctaw Indian graves on it. They used to be marked with red-iron rocks. Now, they are not. My grandfather honored that graveyard, but my grandmother’s brother moved on the farm for a while, removed all the rocks, and plowed up the land. You can’t tell anybody was ever buried there. They’re gone, lost. I have six of those rocks now in my front flower beds. The Choctaws were pushed out of Mississippi and run off to reservations out west. During the 1860s my great great grandfather who lived on that Mississippi land owned two slaves. Think about it. We had slaves in this country, the land of the free. One hundred years after the slaves became freedmen, they still weren’t free. This is the 50th anniversary of Freedom Summer. I was born and raised in Mississippi, one of the hotbeds of the civil rights movement. Three civil rights workers helping register black people to vote were murdered that summer in Philadelphia, Mississippi, just miles from my family land and the home of my grandparents. We have a pattern in this country of doing wrongs and then overcorrecting. We have become the world’s watchdog because of this. It now seems that because we did so much wrong, we are trying to compensate by doing what seems right and good—from offering “government money” to thousands and thousands and thousands of people who enter our country illegally to sending our sons off to faraway places to sacrifice their lives and bodies fighting for the freedom of citizens of other countries. But you can’t right a wrong with another wrong. Somebody needs to fix things soon while that flag is still waving. We just can’t give any more of America away. We need to hold on to America and protect Americans. The government’s first duty is to protect its citizens—their safety, their rights. We’re not. Where will Americans go when we give America away? The sun comes up over the top of the tall house behind me.